Can't Build but Need More Space? Is your school district ready to handle the fluctuation in student enrollment within the next 3, 5, 10 years? How can administration meet the demands of space while maintaining a lean budget? The answer is with portable room dividers. 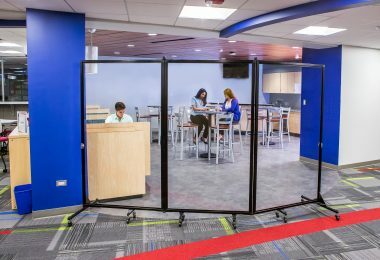 With portable room dividers, it is easy to make additional rooms for temporary or semi-permanent use as needed within the school. What types of portable room dividers are there? 1.) Room Dividers on Casters: These tackable, sound absorbing dividers easily roll into place, unfold accordion style and can be set up in any configuration as needed. 2) Cubicle Type Dividers: These are the type of dividers commonly found in offices and can be dragged/carried from their storage location and returned after use. 3) Wallmount: An L bracket anc hors one side of the Wallmount dividers to the wall. The panels are then extended from the wall as well as stored against the wall. This is best used when a temporary division is needed at the same location repeatedly. 4) Clear Room Dividers: When division and vision are needed, clear room dividers are a logical choice. These acrylic panel dividers are encased in a metal frame for durability. This style of a divider is ideal for TSA agents where separation from crowds is needed but a clear vision is needed to view passengers. 5) Curtains: Heavy or lightweight curtains rest on a pole extended from wall to wall close to the ceiling. The curtains can be opened or closed for their intended use. This style of a divider is best used in a healthcare setting. 6) Shoji Screens: This style of a divider is commonly made of wood and rice paper. These decorative style dividers are commonly used in restaurants with an Asian flair. Whether looking to divide a room into smaller sections or create separation between personnel, there are many options of room dividers to consider. A thorough comparison of product features and abilities will guide you to the right divider for your needs.